We manufacture wide range of Oval Springs matching the industrial demands. Our Oval Springs are the useful for extensive industrial applications. 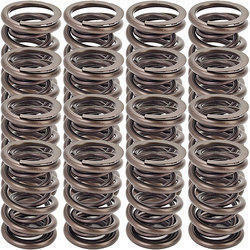 We bring forth Oval Springs wide on demand for various industrial applications. Due to the highly functional and latest tools, these springs attain their perfect oval shape along with accurate dimensions. Oval Springs, that we make available, have wide applications in manufacturing belt joints, automotive starter drive assembly, gas regulators, etc. We are offering wide range of Mixer Ball Spring. Our offered products are highly appreciated by our client's in the market due to their long life and super quality. Moreover, we offer our products in affordable price.